The Myanmar government does little to enable WHRDs to work free from the risk of GBV, despite domestic law and the government’s international obligations. In many cases, the government condones and increases the risk of GBV. • All human rights defenders (HRDs) face risks when exercising their right to freedom of expression in Myanmar, but WHRDs face the added risk of GBV due to widespread gender-based discrimination. • WHRDs expressing themselves on the most “sensitive” of gender-related taboos or challenges to patriarchal power face heightened levels of risk. This includes: campaigning for the rights of lesbians, bisexuals, and transgender people; challenging sexual violence in conflict; promoting sexual and reproductive rights; and advocating for women’s participation and leadership. • There are several distinct types of GBV. The most commonly-reported by WHRDs in Myanmar are: attacks on life, bodily and mental integrity; attacks on personhood and reputations; and violations of privacy. All types are interlinked and WHRDs rarely face only one. 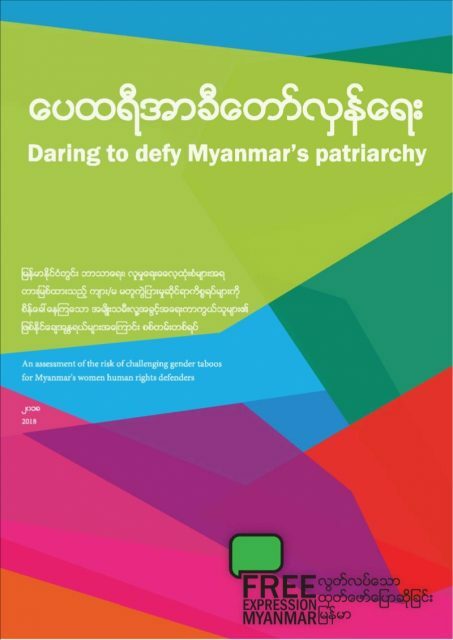 • The risk of GBV is aggravated by Myanmar’s background of patriarchy, militarisation, and religious extremism. • The risk of GBV comes from all parts of the government and security services, as well as from community and family. • State, community, and family “protection” mechanisms generally seek to control WHRDs and limit their rights rather than reduce the risks that they face. • WHRDs have risk mitigation and management strategies and tactics, but these are mostly informal, rather than based on risk management training, and not widely shared.